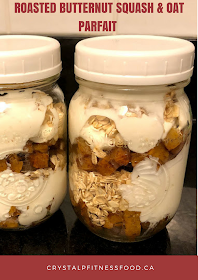 Packed neatly into a Mason jar, yogurt and butternut overnight oats is a perfect grab-and-eat breakfast before early morning workouts. This week I made several of these as my pre-workout meal ahead of time to store in the fridge so I could grab it in the morning to eat before my workout. Peel the squash, cut the bottom (round part) in half and scoop out the seeds. The seeds are only in the round part of the squash the top portion is solid. Then cut the whole thing into bite-sized cubes. Place butternut squash cubes on a parchment lined baking sheet, drizzle on 1 tsp. of melted coconut oil per cup of squash, sprinkle with pumpkin pie spice (or a mixture of cinnamon, cloves, nutmeg and ginger) and roast in an oven heated to 375° F for about 30 minutes, or until soft. When cool, layer half of the yogurt, ½ cup pumpkin, and 2 Tbsp. oats in a jar or other container; repeat.